Who Is In This Postcard? 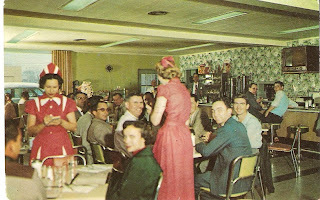 This is a postcard of Shorty's Restaurant, circa 1955, when it was located on Center Street, across from what is now the downtown post office. Can you identify the people in the picture? Who is the waitress? The woman front and center? Any of the other identifiable faces. Email me if you know any of these folks. Whatever Possessed My Mother to Buy These Drapes? 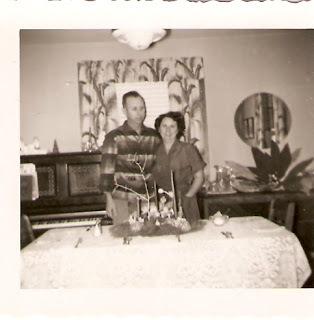 Lyle and Margie Staten in the dining room, Christmas 1955. Check out those groovy drapes! Today it’s simply Armstrong Construction Company but it’s only a block away at 151 Shelby. 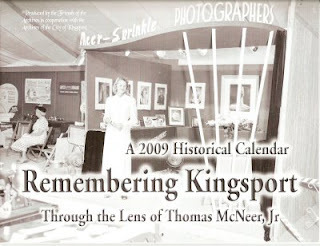 It got me to wondering, what businesses were in downtown Kingsport in 1915, before the city was even a city? And how many are still in business? I knew it wouldn’t be an easy task because there is no city directory for 1915, no phone book. There wasn’t even a Kingsport newspaper in 1915; the Times didn’t begin publication until the next year. I had to assemble my list from 1916 newspapers and early photographs. It’s not complete but it’ll have to do until someone invents a Time Machine. 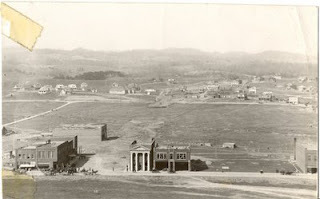 The City of Kingsport Archives has a 1914 picture of downtown taken from Cement Hill. There is no Broad Street in the photo, just compacted dirt and the outline of what would become the street. There were five buildings on Broad, one at each corner intersection with Main, two buildings on the west side of Broad, a vacant lot or two and a building at the corner of what would eventually become Broad and Market. The corner building on the east side was the Bank of Kingsport. 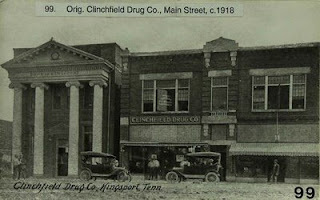 The corner building on the west side was Kingsport Drugs. What would in a year’s time become Armstrong Purkey McCoy is just a construction shack behind the bank in 1914. I can’t make out what the other Broad Street businesses are from the photo. 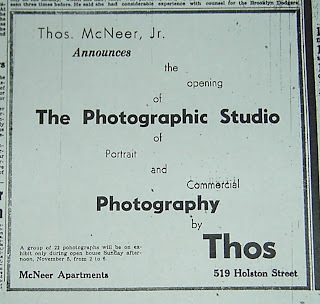 The building no longer exists but in ‘37 Tipton said it was the oldest surviving building in downtown, having been built in 1912. There’s another ad on that page for Clinchfield Portland Cement and a small notice for the Strand Theater, which was at the corner of Main and Shelby, across Shelby from the Big Store (it would be renamed the Gem Theater in November 1924 when the Strand moved to Broad). So we had the Kingsport Stores, Kingsport Drugs, Bank of Kingsport, Citizens Supply, the Strand Theater, the train depot and Armstrong Purkey McCoy, all near the Broad-Main intersection. But that wasn’t all. Walker Nelms General Mdse, No. 7 Broad St.
Bank of Kingsport and First National Bank are still around under different names. But the Hotel Kingsport is gone, along with Mosrie Brothers Café and all the other early businesses. The only business that I can find still surviving under its original name, or close to its original name, is Armstrong Construction, the business that inspired this column.